Conditions:Valid only on items featured on the promotional page. Some other exclusions may apply. I went on live chat yesterday to ask this lol - they said they don't know! I definitely need this code back... and for the sofa I wanted to be back in stock!! I missed furn20 this time., any idea when this will be back again ? They normally update their discount codes on a Wednesday so it may expire tonight. I haven't bought this brand in years, has argos raised the prices for a 25% discount? Seems quite expensive for what it is. Got my milano sofas for £715 delivered few months back with discount. While the look nice i would not have bought them if i tried them in shop. Beware. This offer applies to selected heart shaped jewellery on orders over £25 at Argos. Offer available for a limited time only. Thank you for posting this. I had ordered a bed in the sale on Monday and just cancelled and re-ordered with this extra discount. Cheers. Today's offer from Argos is 10% off a selection Nextbase dashboard cameras. You can apply the discount code in the promotional box after you select pay now. Godammit... 2 weeks too late. Heat. Check on the item page, no instructions so assume it's given with purchase - if not, ask! Which items are in the offer? Clicked the redeem code button, tried to use it on a kids bed (£199) &amp; it didn't work. Meh. They usually update their discount codes each week on a Wednesday so it may expire on Tuesday. It is for selected items only. If you click the "Redeem code" button it should take you to the page with all of the items that qualify for this promotion. Discounts valid on top of all other offers. Valid online and in-store. Excludes clearance lines. Ahhhhhhhhhhh, excellent!, spot on, lol. Yeh, I think it's done now, hehehehe. But like I said before, it's good for possible future usage, and such like? (so no big basically, lol). :-D Thanx. Just type 'argos PayPal' in the search bar on this site and you will see the link, but I think it's expired. Worth a shot. I don’t usually ask for codes but if any body as a code they are not going to use please send it my way. Argos codes last about a week before they change them over, though sometimes they do run the different promotions for an extra week or two. Normally a lot of their codes go live on a Wednesday and expire the following Tuesday so it may be the same for this. Does anyone know when is the expiry of this discount code ? i wanted to order a table and chair space saver set its 149.99 but nothing i order that put the order over 150 pounds allows me to get the discount. Order a sofa set on Monday, delivered today. Could've saved £150. Phoned Argos and asked if they could refund the difference and they said no. So now they'll collect this and I'll place another order :/ tried to save them the cost of picking up and delivering but hey. Sorry OP. Doesn’t work even at this specific store. Valid today Only Enter the code at the checkout. Cracking deal op! Any idea when the code ends? Argos started life in 1973, but really rose to prominence in the 1980s when it spread into every corner of the UK. By 2013, only 4% of homes in the UK were more than 10 miles from an Argos branch. For years, the company centred its retail operations around its famous catalogues, which could be found in almost every household. The stores still include huge catalogues to choose from, but around 50% of the company’s sales now take place online. 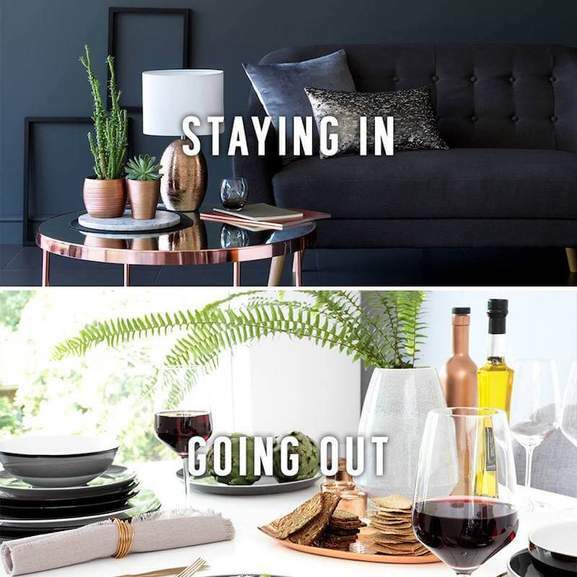 Whether you shop in-store or online, Argos continues to offer major discounts on its own and mainstream brands, and it remains one of the UK’s favourite retailers. Shoppers can either purchase Argos products in-store or online. Finding a store is simple. Just go online to the Argos website an use the Store Locator tool to seek the nearest branch. With 740 stores nationwide, there should be a branch within a few minutes drive of your home. The other option is to head online to visit www.argos.co.uk. Technology – Featuring TVs and TV accessories, laptops and desktop PCs, iPads, tablets, e-readers, video game consoles and video games, iPods and other MP3 players, headphones, stereo systems, mobile phone and phone accessories, telephones, cameras, camcorders, DVD and Blu-ray players, home cinema systems, set-top boxes, home office equipment, Sat Nav systems, batteries and chargers, CDs, Blu-ray discs, DVDs, drones and VR headsets. Home & Garden – Including home furnishings, cookery utensils, pots, pans, crockery, sofas, chairs, armchairs, beds, home improvement materials, bedding, lighting, kitchen electricals, bathroom furniture, washing machines, dishwashers, microwaves, ovens, toasters, dining chairs and tables, mirrors, power tools, conservatories, sheds, greenhouses, garden decorations, garden tools, sideboards, coffee tables, ironing boards, irons, cleaning equipment, bins, barbecues, heaters, hoses, fitted kitchens and Christmas decorations. Baby & Nursery – Featuring cots, cribs, mattresses, baby gates, baby monitors, bedding, nursery furniture, toy boxes, cabinets for children’s clothes, baskets, nightlights, baby mobiles, toys, travel cots and soft furnishings. Toys– Including outdoor toys, LEGO, dolls, playsets, puzzles, board games, action figures, costumes and role plays, pre-school toys, science kits, crafts kits, toy trains, boats and planes, radio controlled vehicles, teddy bears and animal playsets. Sports & Leisure – Including equipment for football, running, swimming, cricket, golf, tennis and other popular sports, as well as bikes, cycling accessories, fitness equipment, nutritional supplements, camping items, caravanning items, travel bags and luggage, games tables, crafts and hobbies products and books. Health & Beauty – Featuring skincare, nails and makeup items, shampoo, brushes, conditioner, hair dyes, nail files, scissors, mobility aids, well-being supplements, perfume, aftershaves, men’s beard trimmers and shaving equipment, dental care products, hair removal products, waxes, gels, essential oils and bath products. Clothing – Including men’s, women’s and children’s clothing. The men’s selection features clothes like suits, jackets, trousers, shoes and beachwear, along with men’s accessories and a special workwear section. The women’s clothing range includes categories like formal dresses, playsuits, heels and boots, skirts, blouses and jumpers, and also features a huge range of accessories. In addition to conventional clothing, Argos also offer plenty of fancy dress costumes for both children and adults. Jewellery & Watches – Including special selections for men and women. The women’s collection includes necklaces, rings, charm bracelets, earrings, bangles, beads and jewellery set. The men’s section includes cufflinks, chains and dog tags. Also features a large collection of watches, including digital, chronometers, formal watches, women’s jewellery watches and watches for sport. Each category at the Argos online store features clearance sections, helping customers find the best bargains. There’s also a Gifts section which suggests items for men, women, children, special occasions and special interests like gourmet food. You can also find novelty items here, along with experience days and wedding gifts. Buying items from argos.co.uk is simple. Just select the items you’d like to buy and add them to your shopping trolley. When you’ve finished shopping, go to your trolley. Now you need to enter your postcode to find out whether the items you require are in stock. If they are, you can pick them up the same day or have them ready to collect any time, or you can have them delivered to your door. Before you can complete your purchase, you’ll need to set up an Argos account. This requires you to enter your e-mail address and a few other pieces of information. After that, you’re ready to enter your payment details and check out. All shoppers with Argos can request an Argos Card. This operates like a normal store card, allowing customers to buy items and pay for them in the future. It can be managed online or via the Argos app, and also provides discounts for regular users. Argos regularly runs promotions called “Price drops” which reduce the cost of selected items for limited periods of time. These are often themed around seasonal events like “back to school” or summer, but there are also regular “Baby event” savings to help out parents. Each product category on the Argos website also has a specific clearance section containing items that are heavily discounted. Again, these discounts are time limited, so act fast to take advantage of them. Argos often offers promotional discount codes for loyal customers. The best way to keep track of these promotions is via the hotukdeals Argos voucher pages. 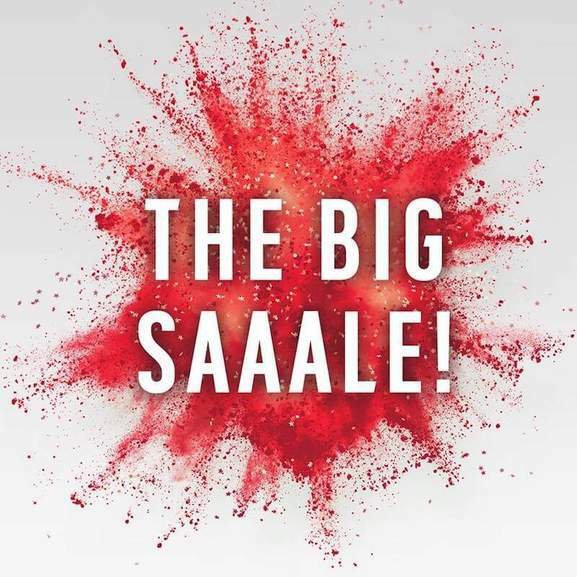 The company is also a big participant in the Black Friday/Cyber Monday retail event, held every November. As Black Friday approaches, be sure to check Argos’ pages, the hotukdeals listings and the company’s social media channels to find out about their biggest discounts. Argos customers can use the following payment methods to purchase their items online: Visa, Visa Electron, Mastercard, Maestro, American Express and Argos Cards. Additionally, customers can pay via PayPal. All payments via Argos.co.uk are also protected by Verified by Visa and Secured by Mastercard to prevent online fraud. Argos operates a tiered delivery service for larger and smaller items. For smaller items, fast track same day delivery costs £3.95 per order if you place your order before 18:00 on the day before delivery. Standard delivery takes longer, and you will be able to choose from a range of delivery slots when you place your order. It also costs £3.95. Some products can also be delivered free of charge via Royal Mail, and this will be shown as an option during the payment process. For larger items, any time next day delivery costs £14.95 (£8.95 for kitchen appliances) and next day delivery with a specific delivery slot costs £19.99 for all items. You need to order before 20:00 the day before to take advantage of next day delivery. Standard delivery for larger items costs £6.95 (free for kitchen appliances) and £8.95 with a time slot. If you are ordering appliances, you can also choose a “Connect” option at slightly higher cost, which includes connection by Argos technicians. You can also request that Argos take your old appliance for recycling. Alternatively, you can choose to click and collect your items from a nearby Argos retail outlet. Most of the time, you can collect on the day of ordering, if stock is available near you. If not, the earliest collection time will be displayed when you order. The majority of Argos products come with a 30 day money back guarantee, as long as the item is unused and in good condition. If it meets these requirements, either a refund or exchange can be arranged. There are two ways to return an item to Argos: at an Argos store or via pick up from your home. One way to return smaller items is by taking them to an Argos store. Remember to take your proof of purchase with you when you visit, which could include e-mail printouts with your order confirmation number. Both smaller and larger items can also be picked up from your home. To arrange a pick-up, you can chat withArgos’ online support staff or give them a call at: 0845 6402020 (8:00-20:00, 7 days a week). Customer service staff will lead you through the returns process, and there is no need to send your items via the post. The Features & Articles section of the Argos website is another good place to look for information about the company, with regular lifestyle features and ideas about how to use Argos products. The Argos app is a useful way to search the company’s product range and manage your Argos Card account. it can be downloaded for iOS devices from the iTunes App Store or for Android devices from Google Play. If you need to make a query about delivery, returns, purchasing or any other aspect of Argos’ operations, getting in touch is simple. The first place to look for help with specific products is the Product Support site. Here, you can find how to guides and phone number dedicated to product categories and brands. The Help section of the Argos website is another good place to look for support and answers. Argos offers furthermore an extensive section of Buyer´s guides that help you make the right decision when you make your next purchase. Go to the online shop of Argos at www.argos.co.uk. Choose items that correspond to the deal. Now, go to the checkout (you may need to register before continuing). Enter your discount code in the box provided and press “Apply”. Your order total will be credited and you can finalise the order as normal. With such a huge range of products on offer, Argos gift cards are a great option if you don’t know what to give someone for their birthday. Gift cards can be purchased in-store or online and can be charged with up to £250 of store credit. If you order online, delivery charges apply, ranging from £1.50 for cards up to a value of £50, to £5.50 for cards worth more than £100. When you order online, you can choose from a variety of designs and add a personal message. You can also choose a specific delivery date to coincide with a birthday if necessary. 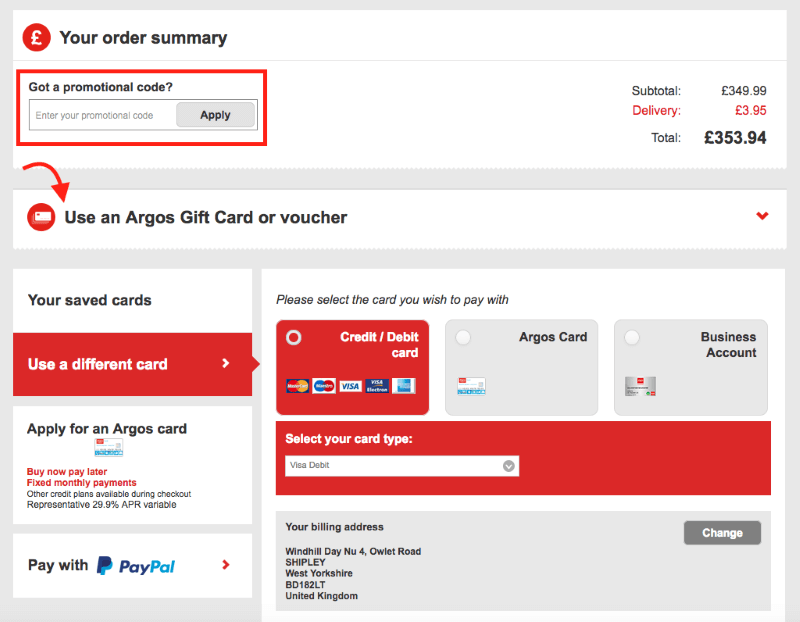 At the moment, Argos gift cards can only be used online to make Fast Track Collection Orders, not for deliveries. To redeem your gift card, proceed to purchase as normal. When you reach the payment page, choose the “Use an Argos gift card or voucher” option and enter your card number and PIN. Now click “Add” and your order will be credited. The balance of the card will remain to pay for future purchases. Few retailers in the UK have a product range as wide as Argos, which is why it’s still one of the most popular stores around. With so much choice on offer, keeping up with Argos discounts can be tough, but it’s much easier to save money if you check out the Argos hotukdeals on a regular basis.